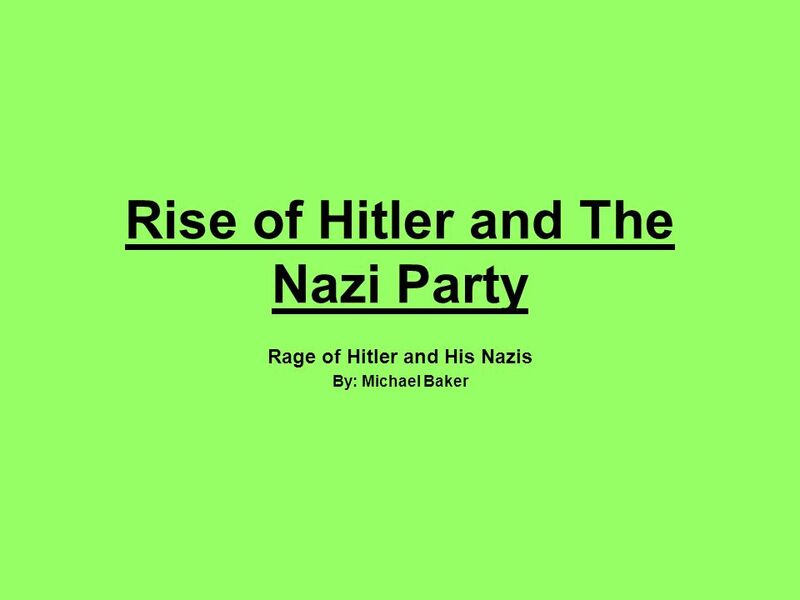 Rise of Hitler and The Nazi Party Rage of Hitler and His Nazis By: Michael Baker. 3 Before Adolf Hitler Became a Leader Adolf Hitler was born on April 20,1889 in Braunau-am-Inn, Austria. 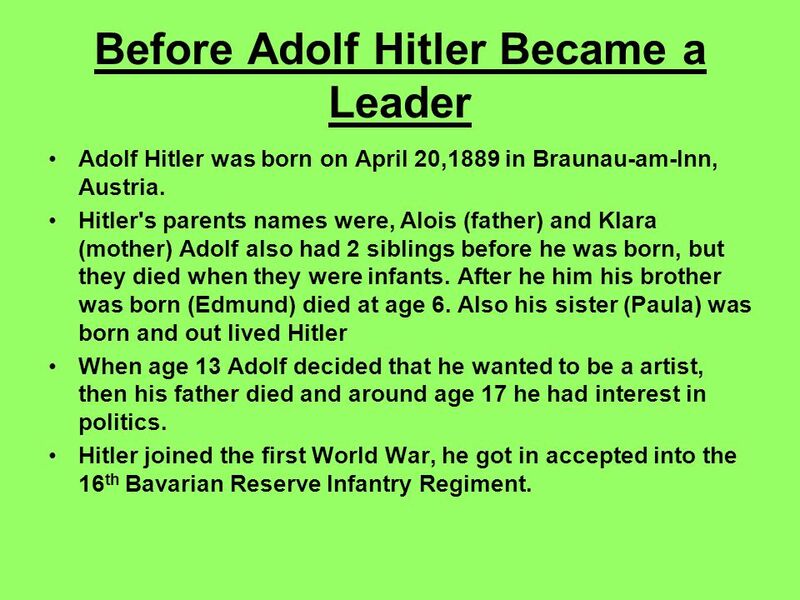 Hitler's parents names were, Alois (father) and Klara (mother) Adolf also had 2 siblings before he was born, but they died when they were infants. After he him his brother was born (Edmund) died at age 6. Also his sister (Paula) was born and out lived Hitler When age 13 Adolf decided that he wanted to be a artist, then his father died and around age 17 he had interest in politics. Hitler joined the first World War, he got in accepted into the 16 th Bavarian Reserve Infantry Regiment. 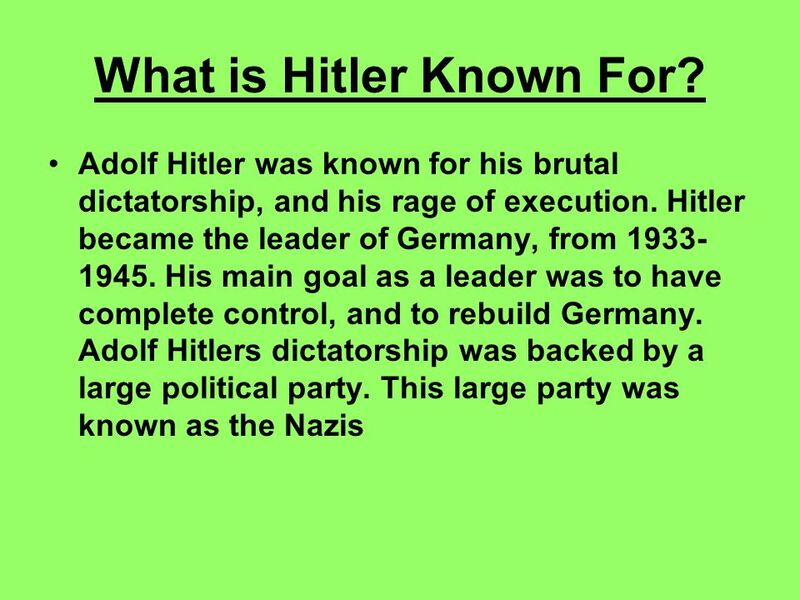 4 Hitler Becomes Leader of Germany During the 1930’s was rebuilding, and built up a powerful army and air force. There were no leaders in Europe strong enough to stand up to Adolfs strong leadership. 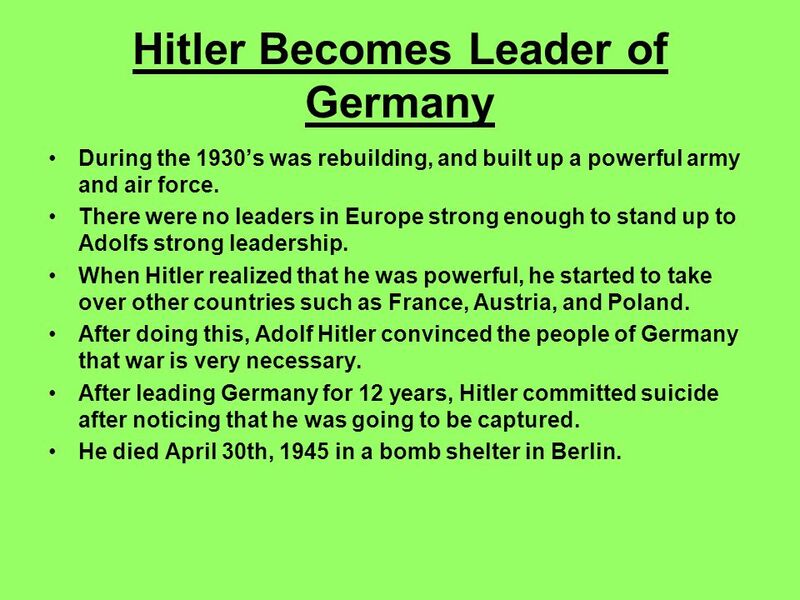 When Hitler realized that he was powerful, he started to take over other countries such as France, Austria, and Poland. After doing this, Adolf Hitler convinced the people of Germany that war is very necessary. After leading Germany for 12 years, Hitler committed suicide after noticing that he was going to be captured. He died April 30th, 1945 in a bomb shelter in Berlin. 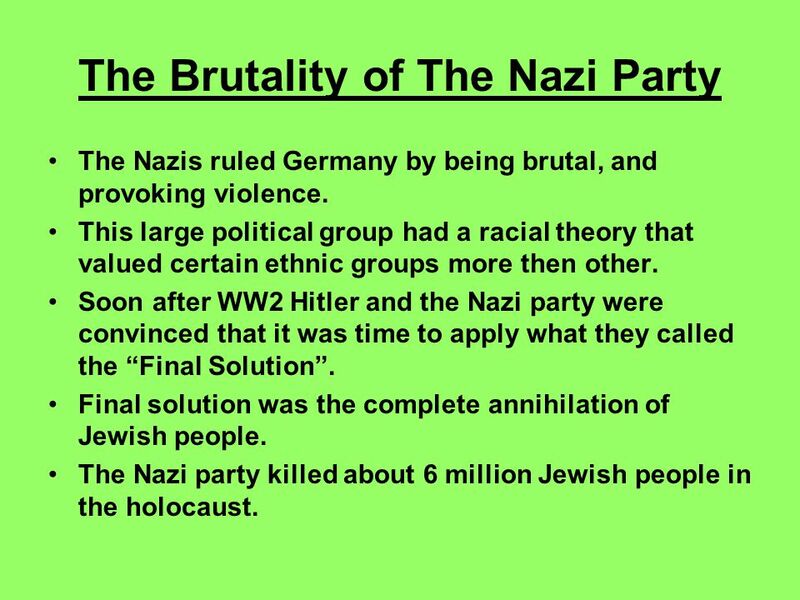 5 The Brutality of The Nazi Party The Nazis ruled Germany by being brutal, and provoking violence. This large political group had a racial theory that valued certain ethnic groups more then other. Soon after WW2 Hitler and the Nazi party were convinced that it was time to apply what they called the “Final Solution”. Final solution was the complete annihilation of Jewish people. The Nazi party killed about 6 million Jewish people in the holocaust. 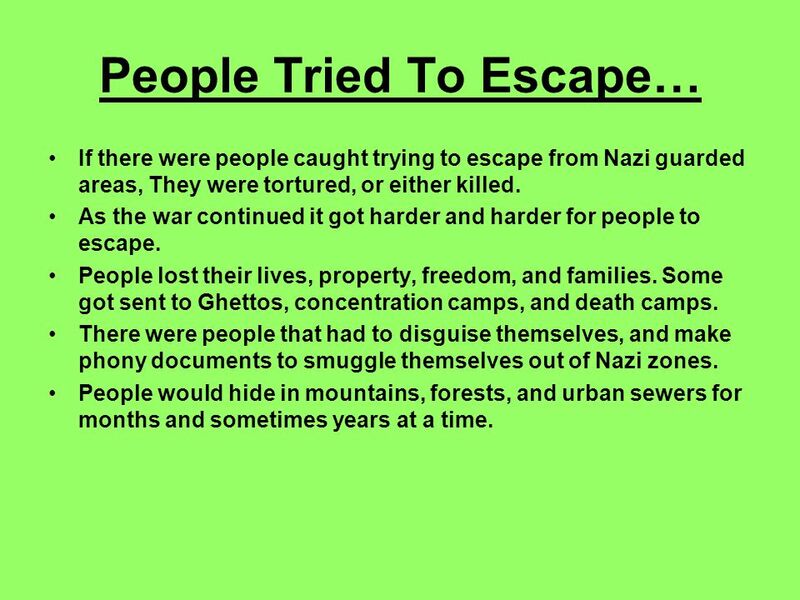 6 People Tried To Escape… If there were people caught trying to escape from Nazi guarded areas, They were tortured, or either killed. As the war continued it got harder and harder for people to escape. People lost their lives, property, freedom, and families. Some got sent to Ghettos, concentration camps, and death camps. There were people that had to disguise themselves, and make phony documents to smuggle themselves out of Nazi zones. People would hide in mountains, forests, and urban sewers for months and sometimes years at a time. 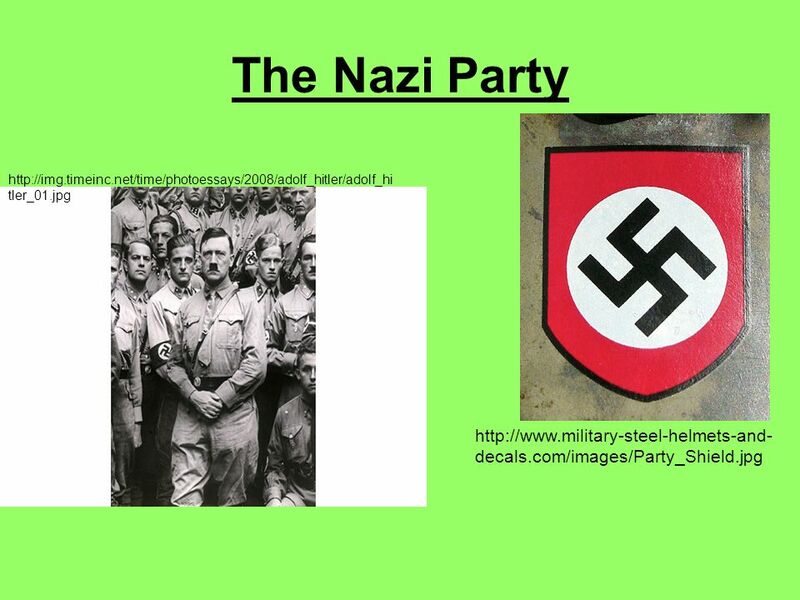 9 The Significance to The War Hitler and the Nazi Party were a big part of this war. Germany didn’t like how WW1 ended, and how they were punished for everything that happened. This is part of the reason why WW2 started,Hitler decided to step up and show that Germany was a powerful country. Hitler was the most wanted leader during this time, for his cruel dictatorship and his Nazi party killing Jews. 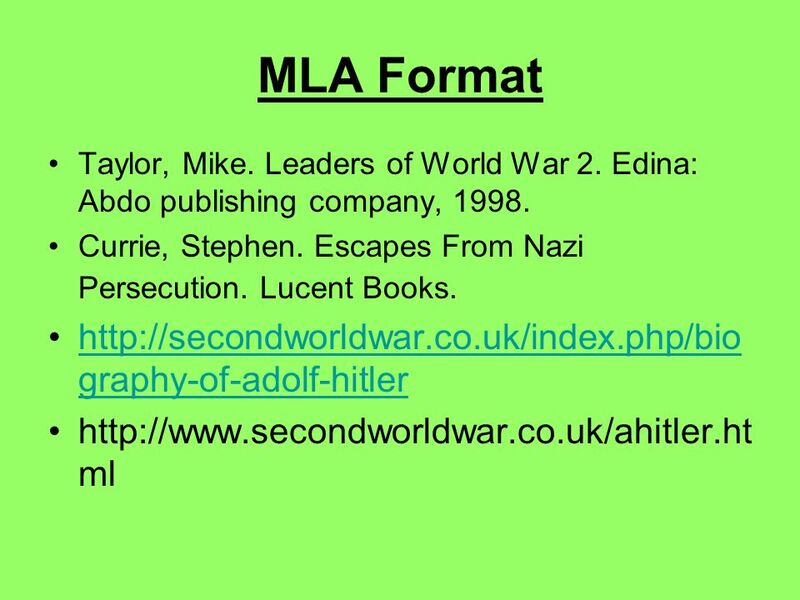 Download ppt "Rise of Hitler and The Nazi Party Rage of Hitler and His Nazis By: Michael Baker."  When WWI ended, strong dictatorships took hold  Germany – Adolf Hitler  Italy – Benito Mussolini  Japan – Emperor Hirohito. BY RONYA!!!.  Before the war even started, Hitler was enraged about the humiliation the Versailles peace settlement brought to them.  He wanted all. 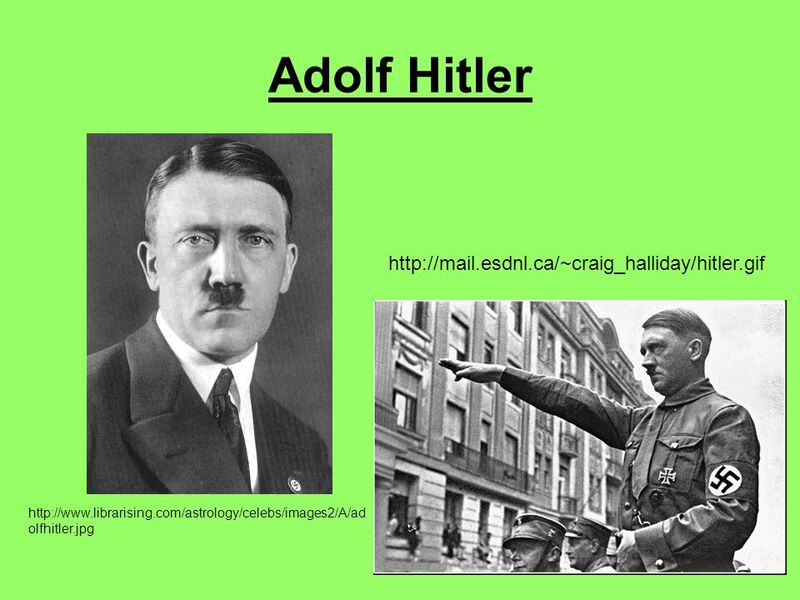 We are doing this power point on Hitler because Hitler was the main cause of World War 2. 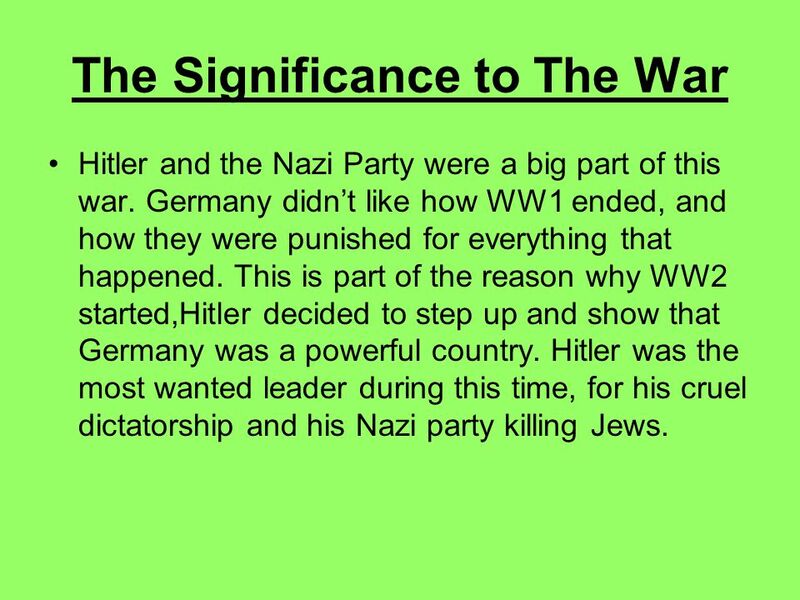 Hitler was ruler of Germany in World War 2. He was a very evil. CH 34(ish) How Hitler came to Power.. Young Adolf Born in Austria-Hungary 4 th of 6 children Family would move to Bavaria, where Hitler would identify. Adolf Hitler By: Zach Montoya & Caleb Peavy. Born and Death Adolf Hitler was born in Austria, on April 20, Hitler died on April 30, 1945 in Berlin. The ruler of Nazi Germany And the man who exterminated a lot of the Jews By Nick Sanford and Alex Sempek Graves of the lost Jewish souls. The 1923 Hyperinflation. Aims: Explain what the word ‘hyperinflation’ means. Identify the effects of the 1923 hyperinflation. : About the Tragedy By: Melanie Bradix. Table of Contents Slide 1………………………….Title Page Slide 2………………………….Table of Contents Slide 3………………………….Introduction. A Brief Introduction.  Adolf was the son of Alois and Klara Hitler  His Father’s original family name was “Schicklgruber” but changed his name when. By Victoria Armstrong. What was Hitler’s “Final Solution’’? 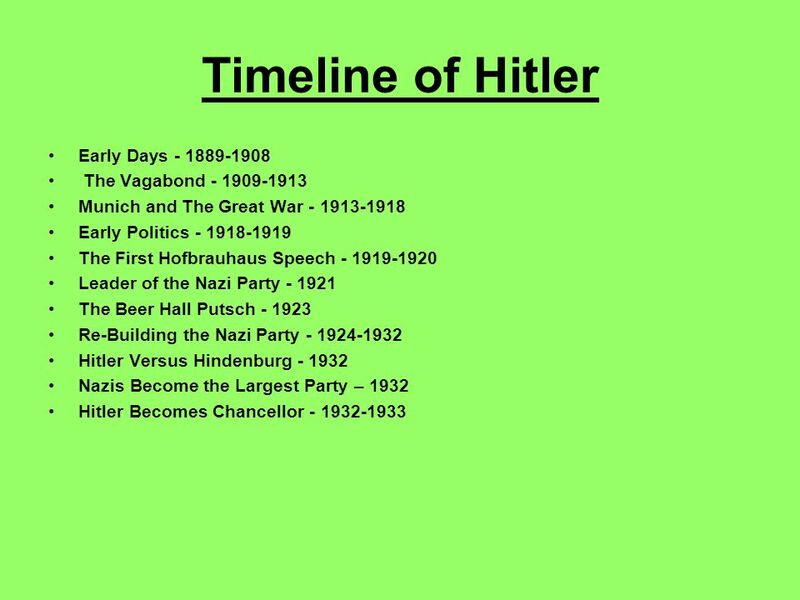 The Rise of Adolf Hitler. In 1919 Germany is forced to accept the terms of the Treaty of Versailles War Guilt Clause: blame Loss of land (colonies) and. RISE OF NAZISM. ESSENTIAL QUESTION What made Germans unhappy after WW I? World War II’s Perpetrator Adolf Hitler. How did Adolf Hitler cause World War II? Adolf Hitler Rise to Power Birth Adolf Hitler was born on April 20, 1889 in Braunau, Austria. Adolf Hitler By: Pranay Ippagunta. Hitler’s Childhood  Early Years  Dictator Adolf Hitler was born in Branau am Inn, Austria, on April 20, 1889, and.